Excavation – Pacific Paving Ltd.
Pacific Paving is pleased to provide professional quality site excavation in Toronto and the GTA. Through digging, grading, tunneling and trenching, Pacific Paving will prepare sites accordingly, optimizing it for further procedures such as concrete or asphalt application. Site excavation can be a time consuming and costly process that is absolutely vital for the proper preparation of any building site. Our goal here at Pacific Paving is to minimize the stress of this process by utilizing the expertise of our trusted team to ensure that the operation is safe, thorough and effective. Since most construction projects are easier when the working area surface is flat and even, site excavation is extremely crucial to the overall success of a project. Simply put, the creation of a clean, level area allows the foundations of a project to be established in the area. Site excavations come before other steps of a project by allowing a site to be safety altered without risk of further complications. With an assortment of specialized equipment combined with the knowledge and expertise of our trained staff, Pacific Paving is well equipped and prepared to handle all types of excavations, large or small. We deal with everything from safe removal of unwanted materials to checking existing structures in the surrounding area for adequate support. In addition to preparing a site for further procedures, a site can also be excavated and backfilled for confirmation of the material on site. For some properties, the material on site is not suitable for the operation that is to take place above—by excavating the site, this progress saves lots of headaches in the future. The depth of an excavation can vary depending on the needs of the client, what is being built on site, and where the construction will be occurring. All of these factors are considered by our crew beforehand to ensure that the excavation is properly and effectively executed for the maximum benefit of the project. Our experienced team will ensure that the site in question is properly and sufficiently excavated with minimal disruption and maximum effectiveness. Pacific Paving should be your top choice for site excavation services in Toronto, Mississauga, Brampton, Oakville, Burlington and Newmarket. 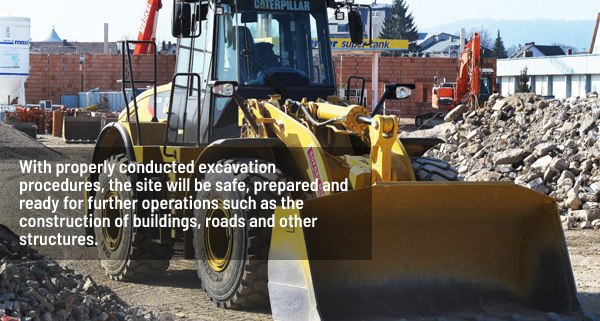 Our experience, knowledge and expertise in excavation will ensure that your site is properly and safety prepared for further operations with effectiveness and efficiency.